The American artists will now compete in the International Olympic Committee (IOC) Art Competition against entries from 48 other nations in June for the chance to win $30,000 and to have their art displayed at the 2012 London Olympic Games. The U.S. contest was conducted by the United States Sport Academy in cooperation with the Art of the Olympians and under the auspices of the United States Olympic Committee (USOC). It was the fourth consecutive U.S. Olympic Sport and Art contest that the Academy has overseen. The sports university has a strong tradition of supporting the arts, establishing the American Sport Art Museum and Archives (ASAMA) in 1984, which arguably features the largest collection of sport art in the world. The U.S. Olympic art winners and three runners up in Graphic Works and Sculpture are on display for a limited time at the Academy’s museum in Daphne, Ala., which is open weekdays to the public for free. 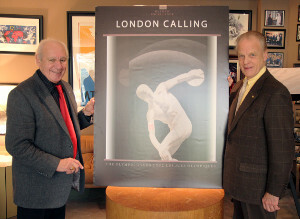 Primo Angeli won the 2012 U.S. Olympic Sport and Art Contest in the Graphic Works category for his piece, “London Calling.” Pictured with the artwork is Academy President and CEO Dr. Thomas P. Rosandich (left), who is on the International Olympic Committee (IOC) Commission for Culture and Olympic Education, and Mr. Jack Scharr (right), who heads Fine Art Ltd in Chesterfield, Mo., the Fine Art Licensee for the USOC for the past 13 Olympic Games. Angeli, a world-renowned artist, has a long history of working with the Olympics. Angeli, who founded and headed one of San Francisco’s oldest and largest design studios, created the official poster to commemorate the 1996 Atlanta Centennial Olympic Games, which was personally selected by the late IOC President Juan Antonio Samaranch. Angeli’s work is on display at the Metropolitan Museum of Art, Smithsonian American Art Museum and The Museum of Modern Art. Angeli’s mixed-media illustration, “London Calling,” depicts the classic portrayal of the ancient Greek discus thrower, Discopolis. Angeli added an armband to him with the 2012 London Olympic logo on it. The piece integrates contemporary branding with ancient fine art for an Olympic celebration. Linson entered the U.S. Olympic Sport and Art Contest for the second time, finishing as a runner-up in the 2008 competition. Linson has a unique style in the representation of the human anatomy that has brought him major commissions such as the President of Lindenwood University. Linson’s works are in numerous private collections. 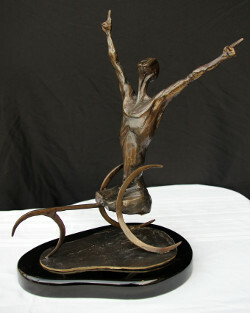 An emerging artist from St. Charles, Mo., Linson’s bronze sculpture, “Omnipotent Triumph,” is a tribute to the Paralympic athlete. It features an Olympian crossing the finish line in his wheel-chair with his arms uplifted in a triumphant “V” for victory pose. The U.S. Olympic Sport and Art Judging Committee was chaired by Jack Scharr, who heads Fine Art Ltd in Chesterfield, Mo., one of the world’s largest publishers of fine art commemorating special events and the former Fine Art Licensee for the USOC for the past 13 Olympic Games. Scharr says the judging held at ASAMA in Daphne, Ala., was difficult with so many outstanding quality works in both Graphic Works and Sculptures. They included entries from several prominent American artists with past involvement in the Olympics. USOC CEO Scott Blackmun says he looks forward to seeing how Angeli and Linson do in the international portion of the contest when results are revealed in London this summer. “We are quite pleased to see the excellent works selected,” Blackmun says. “For the fourth consecutive Olympiad, the United States Sports Academy has demonstrated its expertise in the area of art and sport by conducting the U.S. The IOC’s Olympic Museum in Lausanne, Switzerland, will oversee the international phase of the art contest. It will set up an international jury formed by authorities on art from all five continents along with representatives of the IOC Commission for Culture and Olympic Education and The Olympic Museum. It will award the following prizes for each of the two categories of works of art entered in the international phase of the contest: $30,000 and a diploma for the first prize; $20,000 and a diploma for the second prize; $10,000 and a diploma for the third prize; and five further diplomas for runners up. ASAMA, a division of the Academy, is dedicated to the preservation of sports art, history, and literature. The ASAMA collection is composed of more than 1,500 works of sport art across a variety of media, including paintings, sculptures, assemblages, prints and photographs. The museum is open to the public free from 8 a.m. to 4 p.m. Monday through Friday.